External carotid artery is the artery that supplies originated blood to head. It is one of the branch of common carotid artery. Which in turn is the branch of brachiocephaic trunk (the left one) and aortic arch (the right one). As both right and left common carotid arteries originates from different sources, yet they have the same branches and supply the same structures in head and neck. The two branches of the common carotid artery, that is the internal carotid artery and the external carotid artery originated in the neck from common carotid artery and supplies to different structures in head and neck. Internal carotid artery supplies mostly to the brain. And ECA mostly to face and neck etc. The the point of bifurcation of common carotid artery there is carotid sinus which is the receptor for detection in changes in blood pressure. 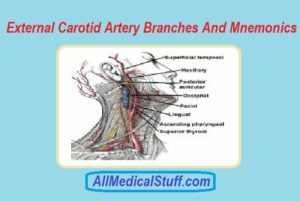 After understanding some basics about the origin of ECA, lets learn about its branches and mnemonics for branches of external carotid artery which would make it much easy for you to learn their names. Just superior to the bifurcation of common carotid artery, under stylopharyngeus muscle, a small branch appear and travel to supply pharynx. This branch is called ascending pharyngeal artery. This is the smallest branch of external carotid artery. As the name suggest, this artery provides/suplies oxiginated blood to tyroid gland. It arises from the external carotid artery below the hyoid bone (greater cornu) and travels and reach to thryoid gland to which it supplies. As the name suggests it supplies the posterior surface of the skull i.e scalp and muscles of the posterior neck. It arises from the external carotid artery just opposite to facial artery and travel to the occipital region just below the posterior belly of digastric muscle. Lingual artery arises from the external carotid artery above the superior thyroid artery and below the facial artery. And supplies oxygenated blood to the tongue. As the name suggest this artery supplies the face. It arises above the lingual artery and opposite to occipital artery from external carotid artery. It is the small branch of ECA and supplies the posterior surface of auricle. Superficial temporal artery is one of the terminal branch of external carotid artery (the other being maxillary artery). It supplies the lateral side of head in the temporal region. As the name suggest this artery supplies the deep structures of face in the maxillary region. It is one of the terminal branch of ECA. To learn in detail about maxillary artery read this guide: Branches of Maxillary artery and Its Mnemonics. You have difficulty learning the names of branches of external carotid artery, you should take advantage of mnemonics given below. Because once you learn these mnemonics, you will never forget the names of these branches. In this mnemonic “S” stands for superior thyroid artery. “A” stands for ascending pharyngeal artery. “L” stands for lingual artery. “F” stands for facial artery. “O” stands for occipital artery. “P” stands for posterior auricular artery. “M” stands for maxillary artery which is one of the terminal branch of ECA. And “S” stands for superficial temporal artery which is the second terminal artery. You have to remember that the first letter of the last two words are the terminal branches of external carotid artery. If the above two are a bit hard for you to remember, i bet you wouldn’t forget this one. The mnemonics given above will only help you learn the names of branches of external carotid artery. If you want to learn the anatomy of these branches as well, watch the video below. This will help you learn the location and structures to which these branches supply.